The age old rivalry is back and how. The most discussed, debated and hotly contested argument of our times. A rivalry that stirs deep unfounded emotions amongst fanboys, that starts flame wars in the comments of articles, that ends friendships forever. Google’s personal contribution to this rivalry has been mostly restricted to software, with the Nexus devices not attaining mainstream popularity. Popular amongst enthusiasts and those looking for a true Google experience, Nexus failed to grab the attention of the masses and was restricted to a niche device meant for the geeks and absolute fanboys. Yesterday though, Google turned the Android market on its head with the launch of the Pixel smartphones. After years of pushing the Nexus devices as a ‘pure Android experience’, Google has finally decided to take things in its own hands and enter the smartphone hardware game. The Pixel and Pixel XL truly represent a pivotal turning point in the Android vs iPhone battle. 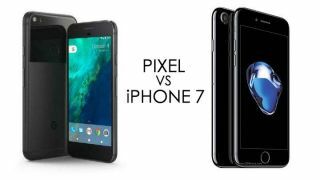 With the iPhone 7/7 Plus being generally considered as a disappointment and an incremental update, is this Google’s opportunity to strike a blow to the mighty fruit named company? The iPhone 7 has a new Retina HD Display, which Apple promises is 25% brighter than the iPhone 6S's display and has a wide colour gamut, supporting Cinema P3 standard colours. The Google Pixel comes with a 5-inch 1080 fullHD AMOLED display, with a pixel density of 441ppi. It is protected by Gorilla Glass 4. On paper, this is a win for the Pixel as the iPhone 7 comes with only a 720p panel. However, we will have to wait till we get our hands on a Pixel to pass judgment, as the iPhone 7 panel is one of the best in the market. Apple's latest spin on the iPhone rocks an aluminum body, much like the iPhone 6S. The ugly antenna lines are a thing of the past now with Integrated Antennas and the iPhone 7 also comes with a new 'Jet Black' finish that looks incredibly suave. Other colors on offer are the standard Gold, Silver, Rose Gold and another shade of black simply titles 'Black'. While HTC has built the Pixel, Google has designed it from scratch, in and out. The Pixel has an all new design that looks extremely sleek, especially in the striking ‘Really Blue’ color. Made of metal and glass, the Pixel has a distinctive ‘window’ on the rear. This is a pane of glass stretching from the camera to below the fingerprint reader and adds a very unique character to the device. Google has managed to make the device look incredibly premium, which is a good thing considering the amount of money Google is asking for it! The aluminium finish looks and feels nice though I do wish Google had reduced the size of the bezels. The iPhone 7 comes with Apple’s new A10 fusion processor. It's a quad-core setup that is said to be 40% faster than the A9 and two times faster than the A8 seen in the iPhone 6S and iPhone 6, respectively. The GPU looks to triple the performance of the A8 and will be more battery-friendly than previous iterations. The Google Pixel comes packed to the gills with Qualcomm’s latest Snapdragon 821 SoC, 4GB of RAM, 32/128GB internal storage, a 2,770mAh battery and a fingerprint reader on the back. Basically, the specs of the Pixel are very similar to any other Android flagship on the market. The Camera on the iPhone 7 has received a complete overhaul and now comes with a new 6-element lens, a wider aperture of f/1.8 that absorbs 50 per cent more light, and an all new high speed 12-megapixel sensor that is 60 per cent faster than the iPhone 6S. The device also features a Quad-LED True Tone Flash, a flicker sensor and an Apple designed image signal processor that uses machine learning to look for bodies and objects in the image and then adjusts the photos by choosing the best exposure and white balance. The Pixel packs a 12MP rear camera with an aperture of f/2.0, phase detection auto-focus, a dual LED flash, electronic image stabilisation and a sensor size of 1/2.3”. The front camera is an 8MP affair with an aperture of f/2.0 and a sensor size of 1/3.2”. The iPhone 7 is the first iPhone to come with IP67 dust and water resistance. Apple has redesigned the home button in the iPhone 7 in order to improve the functionality. It's now force-sensitive, and reinforced with the Taptic Engine - a new addition to the iPhone - which provides feedback on all kinds of user interaction. The iPhone 7 also comes with Apple’s 3D Touch. The iPhone 6S introduced a whole new way of interacting with your smartphone in the form of 3D Touch. First introduced as force touch with the new MacBook back in early 2015, 3D touch allows users to go beyond the established multi-touch and long press, to introduce a third form of smartphone navigation. Google announced its VR platform known as Daydream back at the Google I/O in May. The Pixels are the first 'Daydream-ready' smartphones and come with a low latency display and really accurate head tracking. The AMOLED display also has a faster pixel switching time than LCD, vital for virtual reality where any ghosting is very detrimental to the experience. Pixel phones are the first phones with Google Assistant built in. The Phone 7 costs Rs 60,000 for the 32GB model, 70,000 for the 128GB model and 80,000 for the 256 GB model. Yes! Apple has finally ditched the 16GB base model and has doubled the storage of all the other models as well. This move was long, long overdue. For those used to Nexus device, which presented an exceptional value for money, the price of the Pixel might sting a bit. The pricing of the Pixel is touching iPhone territory.